Gotta love when the first three chapters of a book start off with a bang. I'm a fan of stories which don't take forever to get to some action. There was a kill right at the start!The end of chapter 3 :I think of her again, Anna. 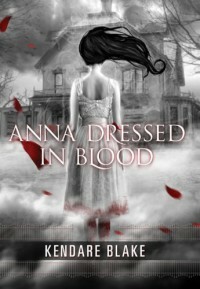 Anna Dressed in Blood. I wonder what tricks she'll try. I wonder if she'll be clever. Will she float? Will she laugh or scream?How will she try to kill me?What's not to love about a lead character who falls for the crazy murdering ghost that he's trying to kill? I guess this is what's bound to happen when you have trouble relating to everyday people.Anna straddles the line between horror and pnr, leaning more toward the horror side. I didn't consider the book to be necessarily frightening, but there is a slight creep/gore factor. Don't let the girly cover fool you - I'd recommend ADIB to both male and female readers. It's dark and full of action. There is a love story, but it's downplayed to the point of being nonexistent up until the very end. I didn't even find the romance necessary in the case of this story, but at least it wasn't invasive.